To revise a line from the Blues Brothers, when it comes to ARKit apps, we've got both kinds — home utilities and games. As such, two more candidates for each category have made their way to the app store. In addition, one by one, NFL teams are taking a pass at augmented reality, though the latest example endeavors to engage fans outside of the stadium. While most examples of ARKit apps for the home have come in visualizing interior decor or measuring rooms, Limitless Computing has updated the SightSpace Pro app to enable home contractors to generate 3D renderings of homes prior to construction for their customers. While the latest update of the iOS app supports ARKit for compatible devices, the AR features are also available for their Android app. "Communicating design visions with clients and colleagues has been a challenge for many architecture and construction professionals. By emailing a SightSpace Share Code to a client, our users can share projects securely with any metadata they choose. Anywhere there is a Share Code - in email, on blueprints, on a construction site - anyone with a mobile device can have an interactive, immersive, Augmented Reality experience. It's augmented reality for everyone," said Jeffrey Franklin, CTO at Limitless Computing, in a statement. Available as a subscription service, SightSpace Pro accepts file formats for most popular 3D modeling software, including Trimble SketchUp and Autodesk. It is also compatible with Google Earth files. If you were looking for an AR version of Sim City with the release of ARKit, you were likely disappointed that the game's publisher, Electronic Arts, declined to fulfill your wishes. Luckily for you, Game Insight has stepped in with their own world simulator, My Country, which uses ARKit to place a tiny world in your home. The game offers a similar experience, with players tasked with building urban infrastructure and making decisions that impact the lives of their microscopic citizens. "ARKit has enabled us to create experiences within My Country that blur the line between the player's world and their creation. This has always been the nirvana of city building games, and we're ecstatic to help players feel like a real part of their cities," said Anatoly Ropotov, CEO of Game Insight, in a news release. In addition, Game Insights will issue an update to their Guns of Boom, a multiplayer first-person shooter, with an AR spectator mode as part of an update this month. The Kansas City Chiefs of the National Football League have joined the ranks of the New York Jets, Green Bay Packers, and Seattle Seahawks in offering an AR update to their iOS and Android apps. 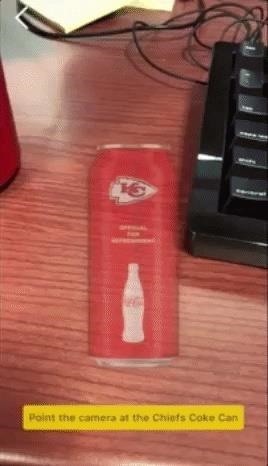 To access the experience, fans use the app to scan cans of Coca-Cola that have the Chiefs logo. The app will display an AR video player that mimics the appearance of the video board at Arrowhead Stadium. The player shows game highlights. 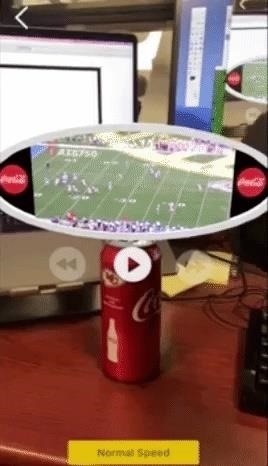 In a cool twist, users can rewind and fast-forward the videos by rotating the can.